Another day, another chance for Peter Sagan. Today’s stage has an uphill run to the line and it’s one for the sprinters rather than the climbers and if Sagan features, so should John Degenkolb and, injuries permitting, Nacer Bouhanni. 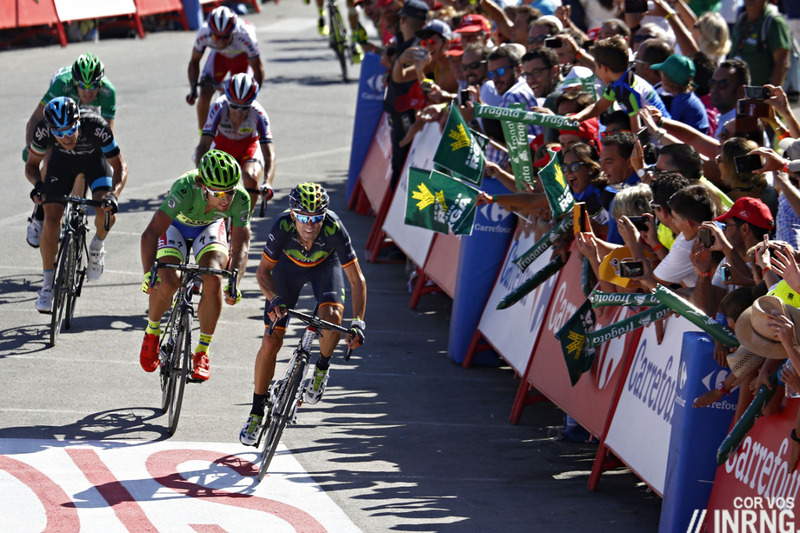 Stage 4 Wrap: a thrilling finish after a siesta procession. The climb to the finish wasn’t that eventful as we only got three serious attacks on the way up thanks to Pello Bilbao, Samuel Sanchez and Nicolas Roche and the television direction helped to confuse things at times. But the tension was there all the time as Peter Sagan tried to hold his place with the climbers, a test of power and momentum. Alejandro Valverde timed his sprint just right and came past Roche with the right line to ensure that if Sagan wanted to pass he’d have to take an even longer line. Valverde is creeping up the overall classification and sits in fifth place now. The Route: the race says goodbye to the coast as it heads north towards Seville for an intermediate sprint before leaving the city for the finish in Alcalà de Guadaíra. The Finish: a fast run into town punctuated by several roundabouts which start just before the 5km to go point. Just before the 1km to go banner there’s another roundabout and then they cross over the Guadaíra river via the Puente del Dragón, a bridge that’s worth watching on TV for its novelty factor. Over the bridge and there’s another roundabout and then a left turn onto the finishing straight, pictured above. If you look very closely you can see the buildings rise. Look beyond the red car and it keeps rising for 500m at an average of 5% but it’s steeper at the end. It’s one of those finishing straights where someone might fancy going early as they can see the finish line from far but it could take them much longer to get there than they think. Here’s the road just near the finish line, the wall says it all. The Contenders: there are no doubts about Peter Sagan’s form now after he’s taken a sprint win and placed second on yesterday’s uphill finish. Today’s uphill run to the line is a synthesis of the last two finishes and he’s the obvious pick. But of all the sprinters in the sport yet alone this Vuelta John Degenkolb and Nacer Bouhanni are among the best in an uphill dash too so they should be close but the latter is nursing injuries. If Bouhanni is hurting then Cofidis have a replacement in Julien Simon, tipped yesterday with a chainring and seventh on the stage but today is more his finish, only he’s a very rare winner. Otherwise Carlos Barbero has to get mentioned in every uphill sprint because the day he’s left out is the day he strikes and both Jasper Stuyven and Jempy Drucker pack a sprint but can turn on the power for a finish like this. Caleb Ewan too is more than a sprinter but has looked out of sorts so far in the race. Weather: hot with temperatures of 34°C and a wind of 15km/h from the south-east. TV: tune in to check the intermediate sprint in Seville forecast for 5.15pm and the finish is the same as usual around 5.40pm Euro time. It’s on Eurosport too and you can rely on Cyclingfans and steephill.tv for links to feeds and streams. Daily Díaz: Rota is home to the largest American military community in Spain. It was built in 1953, during the Cold War when Franco’s fierce anti­communism was more important than his past relationship with Hitler. Eisenhower agreed to help Spain economically in exchange for permission to establish American bases in the country. This alliance is the context for the 1966 Palomares B­52 crash: an USAF bomber collided with an aerial refuelling aircraft, dropping four nuclear bombs. It could have been an atomic disaster, but luckily the bombs didn’t detonate, and the only victims were the USAF crew onboard the planes involved. I was interested to hear Valverde and Sagan interviewed on Itv4 following yesterday’s stage, Valverde who had studied the finish on Google streetview and Sagan who was totally surprised by how difficult it was and not what he was expecting. Totally amazed that in this day and age, with all the free and easily accessible ways to look at a finish profile that top riders are still not aware what they are facing. Likewise and it’s been reported that Valverde was some kind of tech ace to have used Google Maps to study the finish. Actually most teams do it and have done it for a long time if they don’t know the finish so it’s surprising that Tinkoff-Saxo and Sagan didn’t do it. If we have a Dragon Bridge today, the finishes so far this Vuelta have been like a Wolf in Sheep’s Clothing ! Maybe that helped Sagan? headworms might have got in the way? Fascinating about the Nuclear Bombs! Looking at the finish on beforehand in Google street view is very common for pros I am sure. I am just a TV watcher and I do it sometimes. I think this says a lot about the way Sagan prepares himself, don’t you think? Somehow or other, I sort of get the impression that Sagan is the last one out of bed, with father figure Oleg at the bottom of the stairs yelling furiously “Breakfast Peter, BREAKFAST” !! Love the Daily Diaz, it gives an extra bit of depth to the stage previews. In this case, however, I think it’s important to note that it was not luck that prevented the bombs from detonating. A-bombs have sophisticated electronic locks and need to be armed: they don’t go off if you drop them accidentally like a cocked gun with a hair trigger. Two of the bombs’ conventional explosives did detonate, spraying some plutonium around, and one was lost in the sea where it was subsequently recovered by the U.S. Navy. So while scary and not at all a good thing, it was never close to being an atomic disaster. I love the Daily Diaz as well. On the comment about the cocked gun with a hair trigger… I’ve seen plenty of cocked guns with “hair” triggers that have been dropped. Most speed shooters have “hair” triggers and during competitions some do get dropped. I’ve never seen one shoot because of a fall. There are numerous mechanism to prevent that from happening (drop safety, transfer bar, firing pin block, notch, grip…). Guns don’t kill people, people kill people, sometimes with guns, more often with cars, but mostly with food. Felt Sagan just ran out of road yesterday. If he were tactically a bit more astute, he’d be the amazing rider he was promising to be a few years ago. Maybe he still can be…. He is an amazing rider, regardless you loving or hating him. Surely he could win more, but who “could not”? Flecha asked, if he could have won with better timing, tactics or something like that. But he said “no way, in fact this final was a bit too much for me.” Sure, he contested it without knowing exactly how hard it is and it is a good question for DS of T-Saxo. But he was the only classics-rider in top 10, the rest were climbers. To call this result bad is nonsense – remember Valverde being clear leader of UCI ranking mainly thanks Ardene classics. I think the absolute world of Peter Sagan, however, feel like a parent with a child “not working to potential” and just want to go over and shake him. I would never begin to characterize any of his 2nd place results as “bad” but it sure seems at times like a modest amount of tactical and strategic race prep could convert 1/2 or even a 1/3 of these 2nds in to wins elevating an incredible rider in to the legendary discussion. One can only ride the “he’s still so young” caveat so long. Though he is destined for an “exceptional career” without doubt that anyone (of us for sure) would be thrilled with. They have sophisticated locks now but they were terrifyingly basic back then. Recommended reading – Command and Control by Eric Schlosser. I looked up the wiki on the accident as having “a bit of plutonium sprayed around” is never a good thing given its half life. There was significant contamination and the clean up effort goes on to this day. Not sure I’d want to take a dip in the sea around there. just out of interest – Nibali complained today about an internet comment/s re his race in Florence a couple of years back…… one of which was here a couple of days ago in the comments section – I wonder if he read the INRNG article on himself? Or even better keeps up to date with INRNG posts!!! but seems like Nibs has totally lost his head recently – getting angry at internet chatter is surely a route to ruin for any professional athlete – plus the Froome episodes, plus his odd spat with Vanotti as well as Astana….. what’s going on? Should Astana have pushed on with Landa & Aru rather than keeping Nibs? Hard to say, Nibs will probably bounce back and is always a good bet for Giro/Vuelta with Landa not being proven as yet, plus some added star factor – but a terrible relationship now with Astana (can it be rectified?) and Landa’s obvious potential??? Personally I’d go with Landa as I only see Nibali’s star waning against the Quintana, Aru, Froome and soon Landa, Porte, TVG, Yates brothers onslaught, but who knows. How an earth anyone will beat Quintana without the aid of time trials from here on out will be anyone’s guess – Froome may have his number for at most a couple more years, but TVG will never climb in his league, so it’ll soon be up to Landa, Yates, Aru and maybe Pinot to kick on – although he’ll need a substantially stronger team. None of which will could make the necessary gains on a TT……… any of them taking time from Q on climbs seems unlikely. It may sound like insanity but I wonder whether Pinot is actually the most likely? Vastly improved time trial this season, say he had Sky behind him, his climbing will improve and is very good already? in saying that I know every time you say someone will dominate a new name comes along and ends up winning almost immediately! plus Q hasn’t even won the tour yet! I think, we can rest assured, that Nibali doesn’t read the comments section here. But it reminds us once more about one thing that some people seem to forget: The riders are people, too. And just because they are public figures doesn’t mean they don’t deserve to be treated with the same minimum of respect we want to be treated with. It is one thing to say things in privat. Or to write in a comment, that you don’t like what someone has done, to discuss the things you think a rider can achieve or not achieve, but it is a whole different thing to say mean or dismissive things about someone you don’t even know, about the character of a person you have never met. It is always very easy to judge from the outside. In conversation with myself; completely separate point – did anyone hear on the cycling podcast I think Richard Moore saying drop TT’s? what’s people opinions? I think they’re essential for keeping an even race; otherwise the greatest climber of each generation would pretty much always win? Allows route planners to skew routes to being hopefully the most competitive…. Although that hasn’t really worked since 2011 for the TDF *(even if I think they saw Wiggo winning a major success in terms of cycling fan base expanding)…. and maybe it would force riders to use transition stages and = better racing? But it would be a shame to loose TT’s as Grand Tours are meant to be overall test?? basically all in order to create a more marketable overall product from elite pro cycling and take everything to the next level in coming 20years. I agree removing the ITT would be foolish. The race should be about the all round ability of the riders, rather than just a mountain slug-fest. I’ve been an advocate for the reduction in team sizes before – but I worry that this would mean splitting the race in half. Sky already have 9 specialists for 1 goal, but I couldn’t see Saxo for example carrying Sagan if their GC rider only had a maximum of 4-5 riders in reserve. The calendar isn’t exactly perfect, but it feels comfortable. Having a classics season and a GT summer followed by the worlds and last remaining classics feels right. As does the big warm-up tours like PN and the Dauphine. cutting squads in half not teams – so rather than Sky having 30odd riders they have 15 and GT’s can be 8riders or smaller – with therefore more teams so get exclusive support, and the teams have smaller budgets. TTs are a personal bugbear of Richard’s – he seems to find them boring. That’s where this comes from. Cutting squads in half? Even with less races in the calendar, you’ll end up with more riders being pushed by their teams or by themselves to line up in races when they really shouldn’t, either becuase they havent fully recovered from injury, or they’re sick, or whatever. And thats a fertile environment for shortcuts to be taken. I find the chrono stages rather boring as well, but if a Grand Tour is supposed to reveal the best rider, the race against the clock can’t simply be tossed away. I’d like to see the goofy chrono bikes ditched, but that’s another story. I like TTs, and a lot. But, like Larry, I’d like to see the equipment seriously limited, especially cyclocomputer data (real time metrics, etc…), in order to make effort regulation a psychological battle against oneself, not an exercise in calculation based on data obtained during training. Without cyclocomputers, ITT performances would be much less linear, there would be more surprises and ups-and-downs. The other thing about TTs is that as boring as they can be on TV, they are great for live spectating, sort of the inverse of road stages. I particularly enjoy the start, where you can mingle and watch riders warm up and take off out of the start house. Also, on many TT stages it’s not too hard to get to the finish after spending some time at the start. Live, the TT gives you a much better look at the riders as individuals. Compare to road stages where you basically just wait for a flash of riders to whizz by. As for TTs, note Christian Prudhomme doesn’t like them much either and the number of KMs has dropped a lot. There will be at least one in the 2016 Tour, probably at Vallon – Pont d’Arc but the days of two 50km TTs look to be over. They flop in TV ratings. thanks – reading now; just hope they go far enough. women’s tour need to be same place/dates as mens so people watch and it grows – similar to olympic roadraces & tennis – I know some disagree but think they’re wrong. & the calendar needs gigantic changes with tdf/worldchamps coming at the end plus much less racing. 22 also seems too many, shame it can’t be fewer but it’s a start. It’s pretty unusual for men’s and women’s tennis tournaments to take place in the same venues at the same times. This only happens at the Grand Slams and a handful of other events – e.g., Cincinnatti. I think a “race-of-truth” is important to any test (race) that purports to reward a complete rider, but I can remember too many years of “mow ’em down in the chrono and survive in the mountains” tactics (ala BigMig) to want to see more of those type of parcours. That type of racing is generally pretty boring though guys like Claudio Chiappucci tried to liven it up back-in-the-day. A balanced course rewards the complete rider so it sounds like ASO’s on the right track here. Vive LeTour! I’m not particularly interested in there being more money in the sport, and if there is, I want it to go to having more races, keeping all the existing ones, and reviving the defunct ones. But what I cheifly want is emotion, and especially the one I feel when a rider is empty and in pain, and still tries to make it to the finish as son as possible, like a climber trying not to lose his shirt over a long ITT, or a TTist after getting dropped on a climb and still trying to stay in yellow. Orica/Ewing seemed to drop a bomb on the more popular sprinters today. Thanks Inrng and DD for the daily post. Sagan, still a kid and developing nicely recall his TDF displayed strength in most all but the steepest stages with enviable placings. Interesting that they sacrificed the leaders jersey for the stage win. Not sure that was the idea! Agree T, their confidence in maintaining it even given the up coming climbs makes one wonder? I think Orica probably thought they could do both. I assume they didn’t expect Chaves to get gapped by that amount. Regardless, a debut win for Ewan versus a few more days in red for the team is almost a fair trade I’d have thought. The team will be very happy for him. Agree that they didn’t think Chaves would be gapped. Mind you, he’s got his win and the jersey already. “Colombian rider still in red” isn’t as good a headline as “Australian new sensation gets first GT win” for an Aussie team and sponsors.